The star of this classic carrot layer cake is the thick sweetened cream frosting that you spread between the cake layers and on the top and sides. 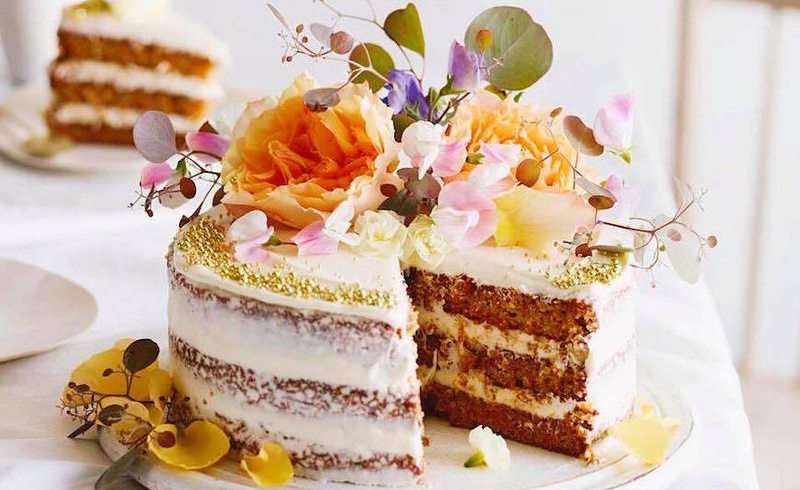 The star of this classic carrot layer cake is the thick sweetened cream frosting that you spread between the cake layers and on the top and sides of the cake. The cake gets extra sweetness from the addition of crushed pineapple to the batter. You can also use this same batter to make Carrot Cake Muffins. Preheat oven to 350°. Combine first 5 ingredients in a large bowl; make a well in center of mixture. Whisk together pineapple and next 4 ingredients; add pineapple mixture to flour mixture, stirring just until dry ingredients are moistened. Fold in carrots. Pour batter into 2 (8-inch) round cake pans coated with cooking spray. Bake at 350° for 22 to 25 minutes or until a wooden pick inserted in center comes out clean. Cool in pans on a wire rack 10 minutes. Remove from pans to a wire rack; cool completely (about 1 hour). Carrot Cake Muffins: Omit Frosting. Place about 15 paper baking cups in muffin pans, and coat with cooking spray. Prepare batter, and fold in 1/2 cup chopped toasted pecans and 1/2 cup golden raisins with carrots. Spoon batter into baking cups, filling about two-thirds full. Bake as directed. Cool in pans on a wire rack 10 minutes. Serve warm or at room temperature. Makes about 15 muffins. For best results, grate your own carrots rather than using a package of shredded carrot because the fresh carrot will be more moist.